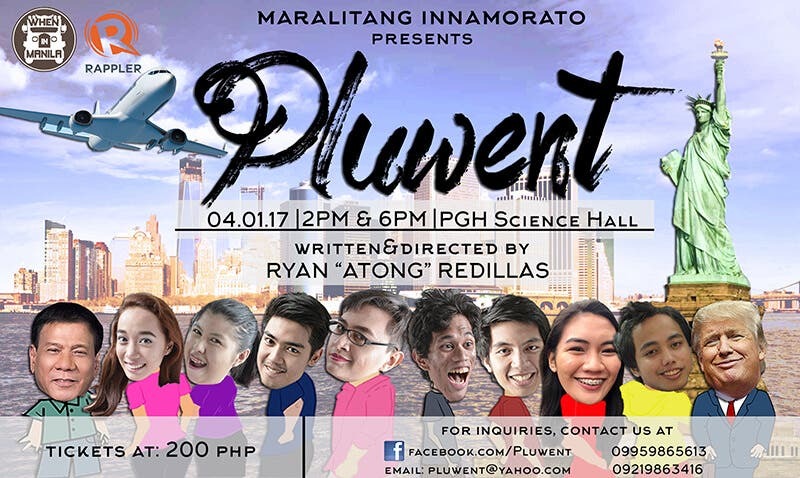 Due to insistent public demand, Pluwent will run for the fourth time on April 1, Saturday, 2 pm and 6 pm at the PGH Science Hall Theater. Pluwent is a story about a small Filipino community caught in the tricky business of overseas life. The cast consists of a closeted gay Professor, an erudite Housekeeper, a vertically-challenged single parent Nurse, many of the disillusioned, some dummies, and a prick. Be warned that whatever images the aforementioned conjures must be dismissed. In fact, brash judgments, stereotypes, assumptions and the like are few of the things taken up in Pluwent. It belabors against double standards and impartiality as counterpointed by institutionalized concepts of queerness, the typecasting of the learned, different reasons for being (raisons d’être), etc. One will find that the sharp exchanges of the play’s idiosyncratic individuals strip our reasoning bare for scrutiny. It raises questions regarding our very loose and taken-for-granted ways, poses the challenge of thinking consciously, conscientiously, and with clarity; and moves us to rethink the logic of our assumptions. With the unique brand of Filipino extroversion and humor, this play will have underscored our barbarism, punctuated our diversity, drawn out our charms, and highlighted our reasons for trudging on though hope deserts us and care wear us down. Pluwent is indeed timely as it tries to make sense of why we carry on and attempt to dream in the wake of pain and tragedy. It is not that life in a foreign land is inherently tricky or hard. The nature of our existence is such that it is complex– we win some or lose some, in relationships, as in everything else, wherever it is we camp. Life leaves us doing what we can with the tools we can spare. Something we all can relate to.